Smriti, one of my cousins, who also happens to be a final year engineering student at Pune, is solely dependent on her smartphone for study materials and completing her project. She says, “Along with her fellow students, she has created a group on WhatsApp to discuss the study, projects and assist each other wherever possible. ‘Harsh’ is my nephew preparing for his medical entrance exams. Whenever he comes across a difficult problem in mathematics, physics or in chemistry he sends his questions to me via his tablet. Sadhna a school teacher by profession and mom of Teesha and Harsh. You will see her working even after her school time, even during weekends, She will be seen formulating questions for exams, checking assignments and question papers, preparing seminar topics and a myriad of school-related tasks. Is it necessary for a working woman and mother of two children to work so hard despite technology has the potential to minimize her workload? Whenever I see such agony and deep efforts our students and teachers undertake to teach and to learn, I always ask a question to myself, can’t we have something to streamline the education sector without affecting its quality and effectiveness? Organizations and startups willing to bring revolution in the educational sector with innovative app ideas can tap the tremendous potential hidden in the educational industry. If you are interested to solve numerous problems of teachers and parents like Sadhna and kids like Teesha, Harsh, and Smriti, this is the chance…! So, is it just the beginning or should we assume that technology disruption in the education domain still has miles to go? Expectations of the younger generation having access to smartphones and tablets are evolving and we pretend to adopt and utilize technology to its fullest are actually lagging behind in every sense. Already technology has leapfrogged in several sectors such as travel, healthcare, retail, social networking and even in the education domain. Nevertheless, the time has come to analyze “What and how much efforts are needed to fully digitize the education sector and what role will we play in this revolution”. Undoubtedly, mobile has influenced our lives in beaucoup ways. Infiltrating the core of our lives, mobile is responsible for making us faster, better and more efficient. Not only we are able to save money, but we are also saving efforts and the time. Similarly, it’s high time to think about making education system faster, better, reliable and of course widely efficient. With the penetration of Internet of Things, this farfetched dream surely seems within our reach. Information whether you access it using a desktop, smartphone or a tablet, it is meant to enhance your knowledge. You cannot carry a desktop to school, but you surely can carry a smartphone or a tablet. Recently, these wireless, connected gadgets have emerged as one of the key options in imparting education. The education apps are playing a key role in learning as well as teaching. Countries like America have already started experimenting with educational apps allowing students to learn online by attending virtual classes without attending the school. Thanks to iPad, now it is not necessary for students to carry the daily burden of school bags. 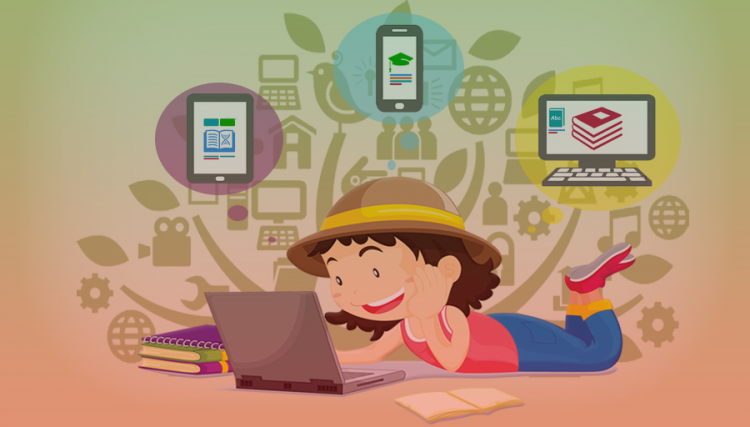 Educational apps developed for smartphone and tablets, compatible with various operating systems already started revolutionizing the educational industry. Although the majority of countries has excelled at the forefront of tackling basic educational problems like enrollment and curriculum, significant challenges still hover regarding delivery of quality education. Inequality to access education, delivery of cost-effective and quality education are two major barriers to impart education. If we want education to play a paramount role in bringing about socio-economic development, then we should start offering new models of delivery to transform teaching and learning processes. In an attempt to find a viable solution to these challenges, educational industry placed its hope in modern information and communication technologies. Mobile apps are contributing effectively in accomplishing a higher degree of precision and efficiency. Similarly, teaching and learning have become fun with evolving mobile apps. 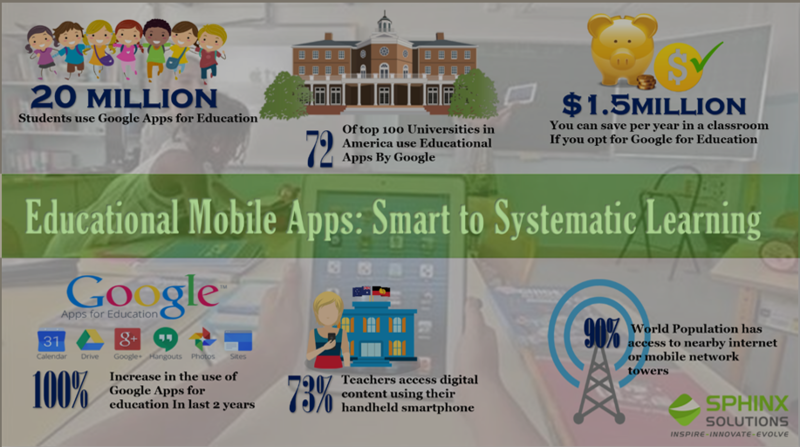 Expecting that these mobile apps continue to enhance the effectiveness and quality of education. Let us consider how these apps are achieving it. Versatility in Apps: Android and iOS together have a number of apps covering every subject from language to history and from mathematics to craft. Students can seamlessly download and start using any app they like. Almost all the e-learning apps are compatible with both Smartphone as well as Tablet. Easy Accessibility: The Learning management system educational apps/e-learning apps have concentrated on offering visually lasting ways of designing educational courses. The portability of the device enhances accessing the applications anywhere and anytime, allowing students to learn at their convenience. Systematic Learning: Surpassing the boundaries of smart learning. Mobile learning or the mobile apps used in educational industry have brought about a new concept of systematic learning. Arranged in a systematic or cyclic flow, the apps maintain a flow and students go along with that flow with increased curiosity and excitement. Collaborate to Cooperate: There are too many innovative educational apps helping teachers, students, and parents to collaborate and enhance the overall performance of the students, thereby improving the effectiveness of the educational system. Moreover, some teachers use these apps to keep track of various aspects of performance assessment, grade records or attendance, thereby increasing transparency and leaving no loopholes behind. Keeping Students Engaged: Many students excelling in one subject always fear a particular subject as it is hard for them to understand that particular subject. By allowing students to learn using audio, video files, students can save and keep those files as long as they want to master the subject. Watching videos, listening audios and practicing the concept helps students to understand the deeper meaning, particularly science. Together with the educational system, we need to overcome the traditional mold of dispensing education. By collaborating with organizations, M2M ecosystem, technology specialists and government, we must vow to bring a radical change in the way students learn and teachers teach. Together we can and we will make mobile apps emerge as a key player in the future educational system. Let us promise ourselves that we will use innovative technology for the betterment of our education system. 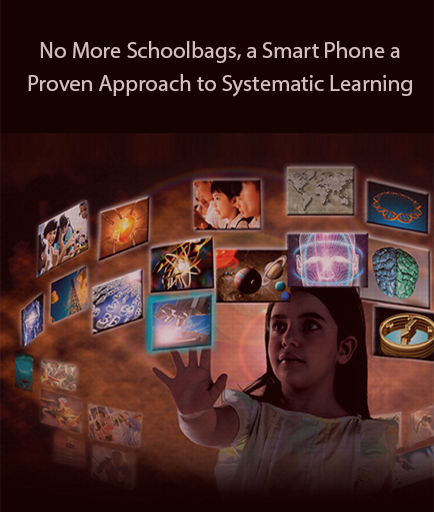 Mobile technology has reinvented the way of imparting education to present and future generations. Our specifically tailored and feature-rich Educational App Development strategy offers the entire world’s knowledge at the student’s fingertips. Vouching to overcome all the barriers in delivering quality education, we are committed to developing educational apps that will make learning and teach a fun experience. Message From Sphinx Leaderboard: Hey kids, Students, Teachers, Parents, Educational Institutes – Will you please share your problems or dilemmas in teaching and learning? Tell us how an app can solve your problems. Do share what features you expect in an app? Call us, Email Us or Contact us so that together we will try to make our educational system more effective.